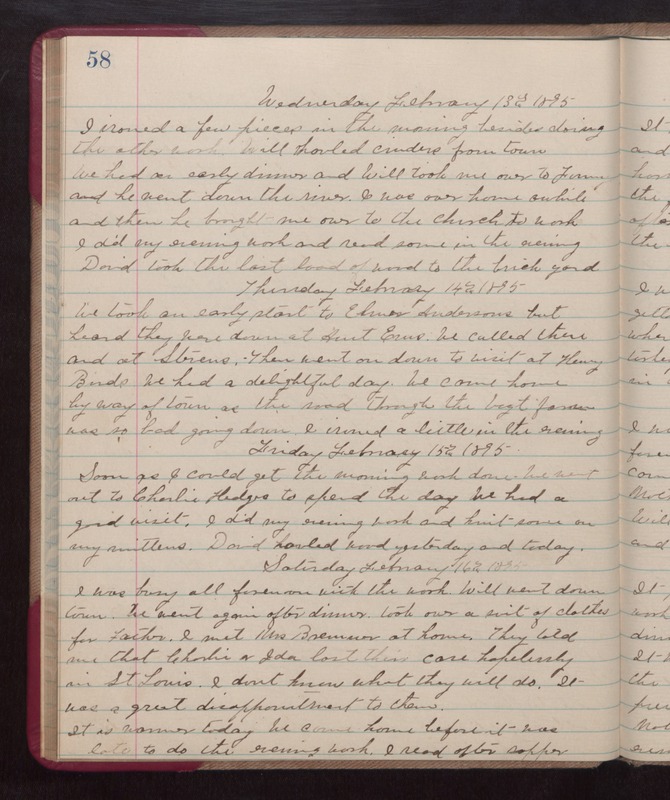 Wednesday February 13th 1895 I ironed a few pieces in the morning besides doing the other work. Will hauled cinders from town. We had an early dinner and Will took mem over to Fannys and he went down the river. I was over home awhile and then he brought me over to the church to work. I did my evening work and read some in the evening. David took the last load of wood to the brick yard. Thursday February 14th 1895 We took an early start to Elmer Andersons but heard they were down at Aunt Ems. We called there and at Stevens. Then went on down to visit at Henry Birds. We had a delightful day. We came home by way of town as the road through the [Vogt?] farm was so bad going down. I ironed a little in the evening. Friday February 15th 1895 Soon as I could get the morning work done We went out to Charlie Hedges to spend the day. We had a good visit. I did my evening work and knit some on my mittens. David hauled wood yesterday and today. Saturday February 16th 1895 I was busy all forenoon with the work. Will went down town. We went again after dinner took over a suit of clothes for Father. I met Mrs Bremmer at home. They told me that Charlie & Ida lost their case helplessly in St. Louis. I don't know what they will do. It was a great disappointment to them. It is warmed today. We came home before it was late to do the evening work. I read after supper.